Pietermaritzburg (UK /ˌpiːtəˈmærɪtsˌbɜrɡ/; Zulu: umGungundlovu) is the capital and second largest city in the province of KwaZulu-Natal, South Africa. It was founded in 1838, and is currently governed by the Msunduzi Local Municipality. Its Zulu name umGungundlovu is the name used for the district municipality. Pietermaritzburg is popularly called Maritzburg in English and Zulu alike, and often informally abbreviated to PMB. It is a regionally important industrial hub, producing aluminium, timber and dairy products. It is home to many schools and tertiary education institutions, including a campus of the University of KwaZulu-Natal. It had a population of 228,549 in 1991; the estimated current population is around 500,000 (including neighbouring townships) and has one of the largest populations of Indian South Africans in South Africa. The city was originally founded by the Voortrekkers, following the defeat of Dingane at the Battle of Blood River, and was the capital of the short-lived Boer republic, Natalia. Britain took over Pietermaritzburg in 1843 and it became the seat of the Natal Colony's administration with the first lieutenant-governor, Martin West, making it his home. Fort Napier, named after the governor of the Cape Colony, Sir George Thomas Napier, was built to house a garrison. In 1893 Natal received responsibility for their own government and an assembly building was built along with the city hall. In 1910, when the Union of South Africa was formed, Natal became a province of the union, and Pietermaritzburg remained the capital. A view of Church Street in central Pietermaritzburg, c. 1900. There exist two interpretations about the origin of the city's name. One is that it was named after Piet Retief and Gert (Gerrit) Maritz, two famous Voortrekker leaders. The other is that it was originally named after Piet Retief alone, since his full name was Pieter Maurits Retief. In this interpretation the original name was "Pieter Maurits Burg", later transliterated to the current name (Jenkins, 1971:11). Retief in fact never reached Pietermaritzburg and was killed by Dingane, successor to Shaka, king of the Zulus. Maritz died of illness on 23 September 1838 near the present-day town of Estcourt, some hundreds of kilometres northwest of Pietermaritzburg. This was after the battle with the Zulus at Bloukranz, and Maritz did not ever reach the Pietermaritzburg area. In 1938, however, the city announced officially that the second element Maritz should also honour Gert Maritz. At the time of the rise of the Zulu Empire, the site that was to become Pietermaritzburg was called Umgungundlovu. This is popularly translated from the Zulu as "Place of the Elephant", although it could also be translated to mean "The elephant wins". 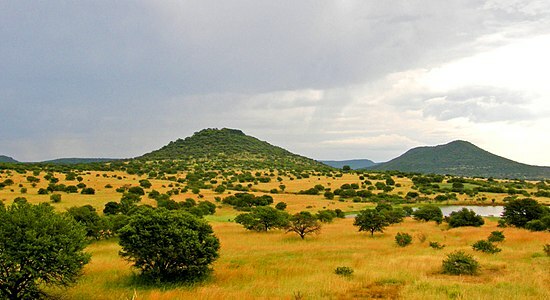 Umgungundlovu is thus thought to be the site of some Zulu king's victory, since "Elephant" (Indlovu) is a name traditionally taken by the Zulu monarch. Legend has it that Shaka had his warriors hunt elephant there to sell the ivory to English traders at Durban (then called Port Natal). Today, the town is still called by its Voortrekker name, although the municipality of which it is part bears the Zulu name. The University of Natal was founded in 1910[as the Natal University College and extended to Durban in 1922. The two campuses were incorporated into the University of Natal in March 1949. It became a major voice in the struggle against apartheid, and was one of the first universities in the country to provide education to black students. This campus boasts association with a remarkable array of world-class academics and has famous alumni distributed throughout the world. It became the University of KwaZulu-Natalon 1 January 2004. During the Second World War, Italian prisoners of war were housed in Pietermaritzburg. During their stay, they built a church, which remains standing as a heritage site today. Welcome to Wowcity fellow South Africans! The South African Wowcity is a web-based platform for local business search, ideas and expression, a resource of opportunities, and a network of inspirational young people and their projects.